JESSE McADAMS. This name is one of the oldest and most honored in Bond County, Ill. It was borne by the grandfather of our subject, who was one of the very first settlers and did much for the early development of this part of the State. Our subject is the owner of over one hundred acres of fine land, and is a worthy representative of his ancestor. The name of Jesse was bestowed upon our subject at the time of his birth, April 28, 1847, on this farm, that being the family name, his father and grandfather having borne it. Both the father and grandfather were natives of Kentucky, although the latter's immediate ancestors had come to this country from Scotland and Ireland. In the new territory opened for settlement, where the Indian, wolf and deer still found a home, came the family of Grandfather McAdams in a great wagon, with their household effects, to settle on the tract of Government land which he had taken up. A log cabin was erected on the edge of the timber on what now is section 34, in this township, and in this lonely spot the pioneer life went on. Here was developed a fine farm, but under many difficulties. There were no roads at that time, and often the Indian trails were dangerous and almost impassable, but the produce had to be marketed at St. Louis, a distance of four days' travel, and from this place had to come the luxuries which the pioneers seldom allowed themselves. The precious ''store tea," which in sickness took the place of sassafras or sage, was one of the coveted articles which it was difficult to procure. The rugged old man who braved so many dangers and paved the way for the footsteps of his descendants, was supported by a faith that taught him to labor and live righteously, and his reward would come in another world. A firm Presbyterian, his house was given to the members of that belief who had settled near enough to attend services when some missionary came into the neighborhood. In his political faith he was a Democrat, and the principles of that party were ever dear to him. The father of our subject had his experience of pioneer life, as he was only a boy when he was brought into the new country to find a home. He learned the carpenter's trade, and some of the large buildings now standing in Greenville testify to his workmanship. His amusement in youth was to shoot deer as they fled by his home, and never was there any scarcity of game in the house, as his musket was often used for the pleasure of hunting. Like his father, he grew into a man of great firmness of character, and although he was a peaceable citizen he insisted always on his rights. At his death, at the age of forty-five years, he was the owner of four hundred acres of land. The mother of our subject, was Elizabeth Williamson, who was a native of Bowling Green, Ky., and came here with her Grandfather McAdams. She became the mother of nine children, of whom four are yet living, namely: Nancy, Catherine, Hiram and Jesse. She died when over seventy years of age, in the faith of the Cumberland Presbyterian Church, of which she had been a consistent member for many years. Our subject was reared on the farm and attended the log schoolhouse which was nearest his home, and there he learned all that the teacher could impart. There were not many luxuries in the school buildings of that day, but upon the slab benches sat many of the lads who became in after years the most prominent and powerful men in the State. The loss of his father our subject did not realize, as he was only a baby of five months. At the age of fifteen years he had to go out to battle with the world by himself, and his first attempt at work was by the day, and then he began farming upon the home place. On June 21, 1868, he was united in marriage with Miss Louisa Long, whose death occurred one year later. His second marriage took place October 7, 1872, when Miss Leonora Durant became his wife. She was born in Ohio, near the city of Columbus. Our subject is a man of means, owning a farm of one hundred and twenty-five acres of land, all of which is improved except six acres, which he has in timber. He has been a grain farmer and has handled stock also. The present neat frame residence was built in 1879 and here he has made a great many improvements. Both Mr. McAdams and his wife are members of the Methodist Episcopal Church of Greenville. In politics, he is a Prohibitionist, and believes that in that reformatory party lies the redemption of the country. The Modern Woodmen is the order with which he has connected himself, and in this body at Greenville he is regarded with much esteem. 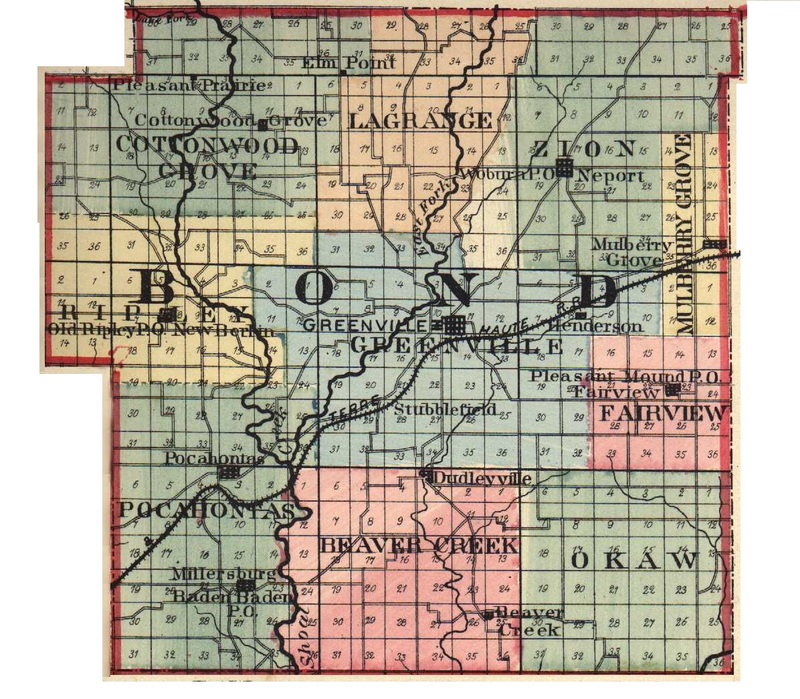 Extracted 20 Dec 2016 by Norma Hass from 1892 Portrait and Biographical Record of Montgomery and Bond Counties, Illinois, pages 308-309.